The Red-breasted Nuthatch inhabits mixed-wood and coniferous regions, preferring spruce-fir forests. This bird lives mostly on the branches of trees instead of on the trunks, and in this way resembles a chickadee. The Red-breasted Nuthatch gets a special view of things by looking at the world upside down. Like the 16 other known nuthatch species, it is able to descend head downwards on tree trunks and branches. This is how they search in nooks and crannies in bark for tiny organisms overlooked by other birds that glean food while moving in an upright fashion. An exceedingly active bird, the Red-breasted Nuthatch moves rapidly from one tree to the next in an undulating flight. 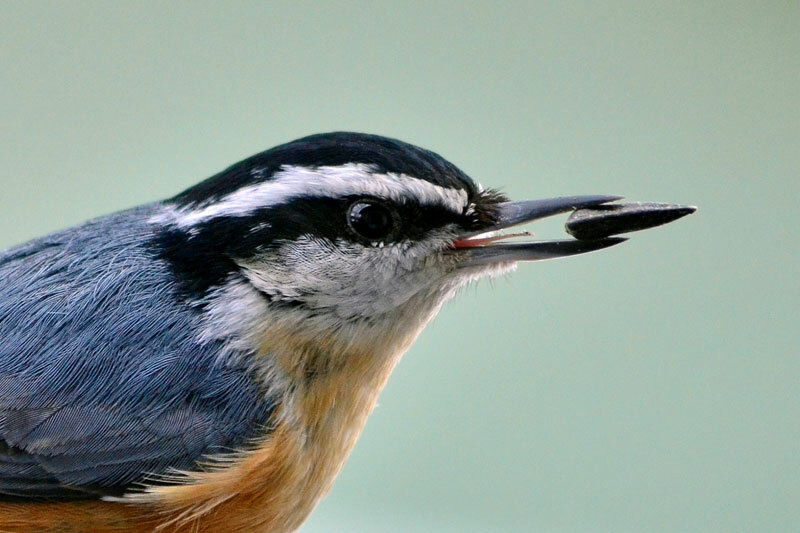 Its habit of creeping mouselike along tree limbs means it is easy to overlook, and the Red-breasted Nuthatch’s high-pitched nasal yank-yank is often heard long before the bird itself is seen. 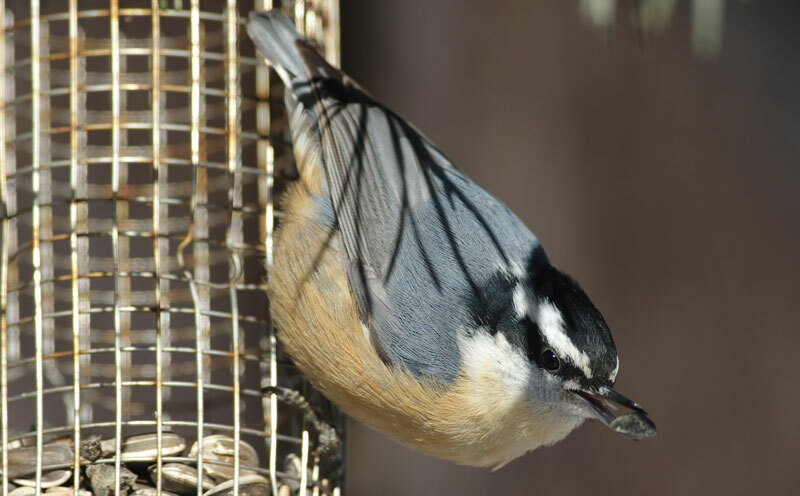 The name "nuthatch" is derived from "nut-hack," a reference to the habit, especially in the European Nuthatch Sitta europaea, of hacking or pecking open nuts. 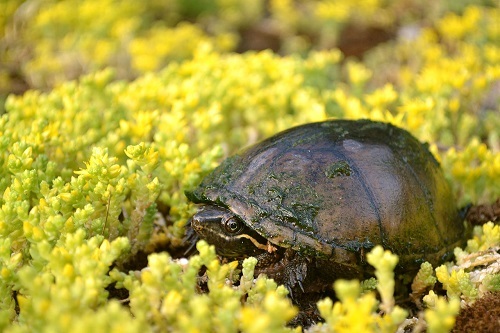 It wedges hard-shelled nuts, such as hazelnuts, and other hard seeds in a bark crevice and then hammers them with its bill. The Red-breasted Nuthatch has a greatly enlarged hind toe and a stubby tail, which are probably both adaptations for climbing downwards; the toe provides secure footing, and a long, floppy tail could get in the way. Originally called Le Torchepot du Canada, the Red-breasted Nuthatch is familiar to most North American bird watchers. 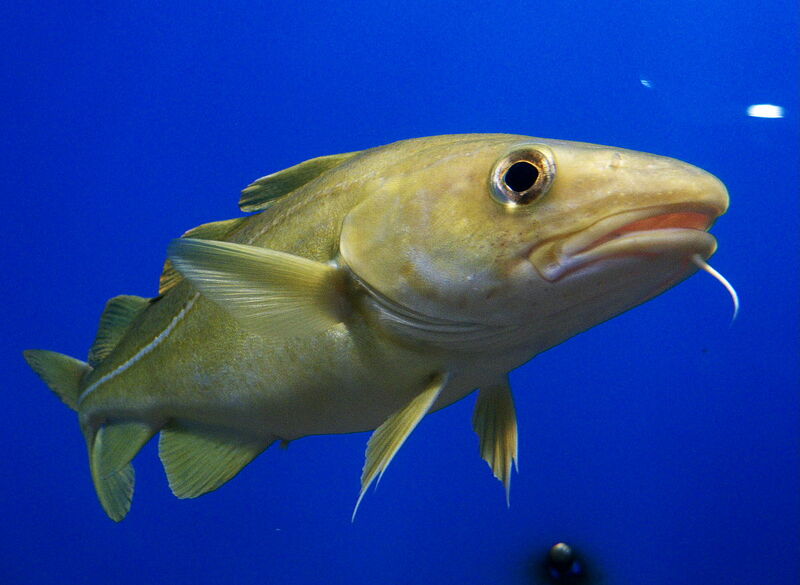 Its present name in French is La Sittelle à poitrine rousse, a literal translation of its standard English name. 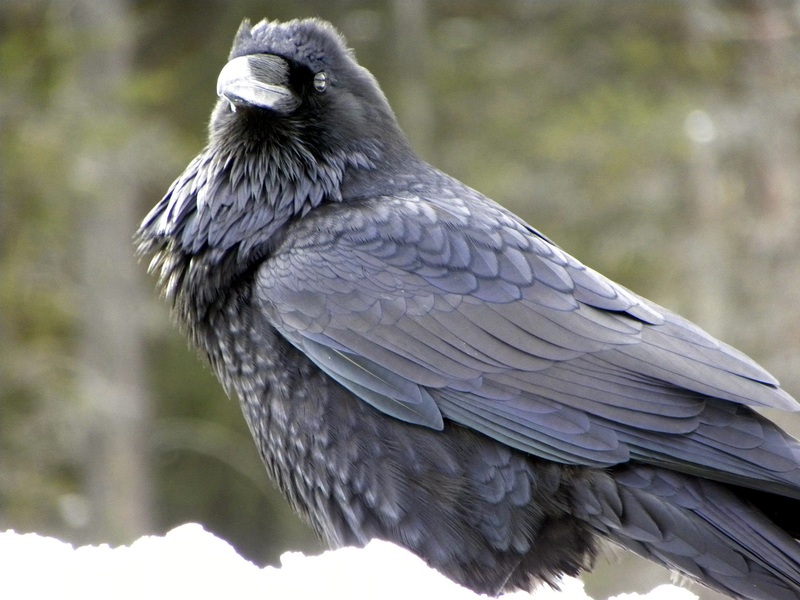 It has been locally called "upside-down bird" (Newfoundland and Labrador), "tomtit" (Nova Scotia), "cardy bird" (New Brunswick) and "little quank" (Ontario). 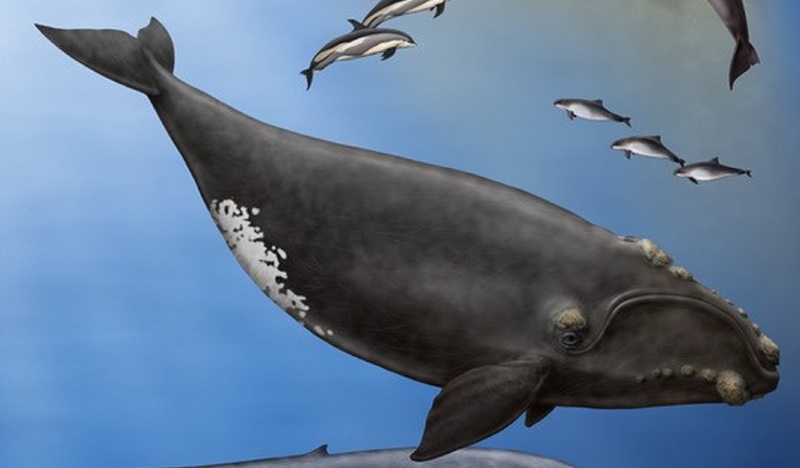 Doubtless there are other pet names for this widely distributed species. 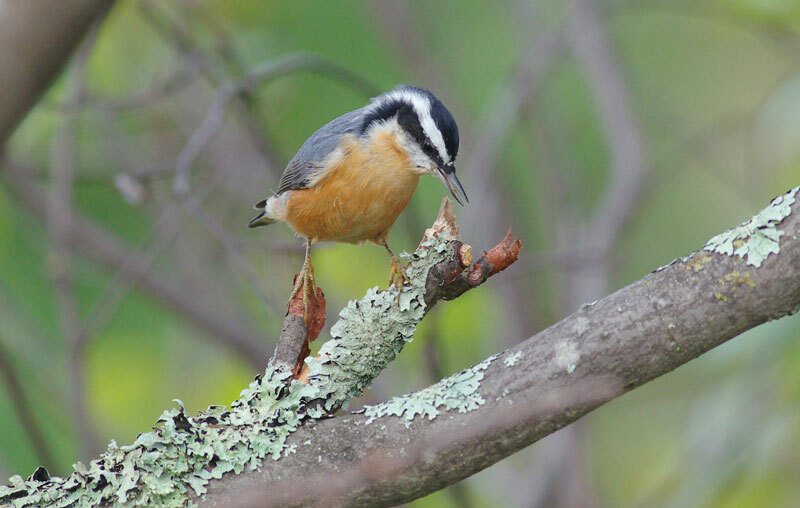 The Red-breasted Nuthatch’s breeding range covers much of the boreal, or northernmost, forest region from Alaska to Newfoundland and Labrador south through the Appalachians to eastern Tennessee and North Carolina. 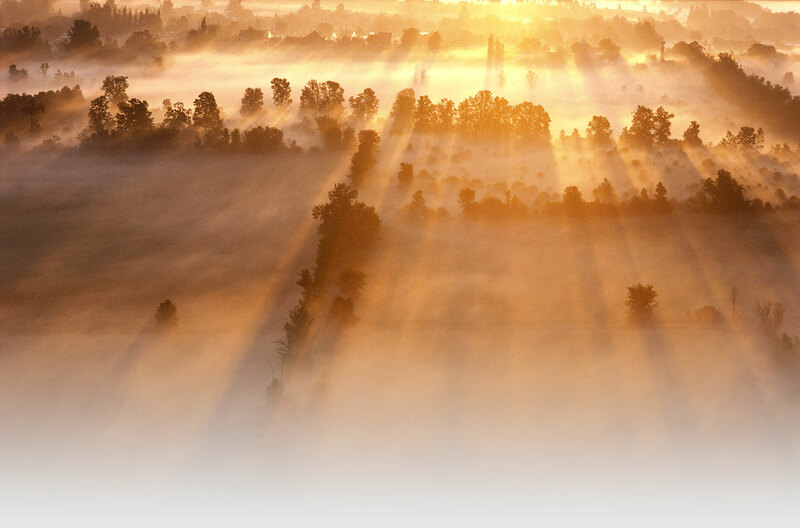 It also occurs in the western coniferous forests south to California and Arizona. 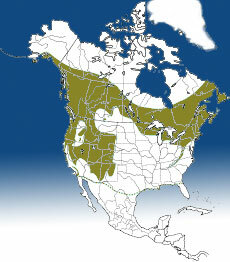 Although largely permanent residents, some nuthatches move southward each winter. 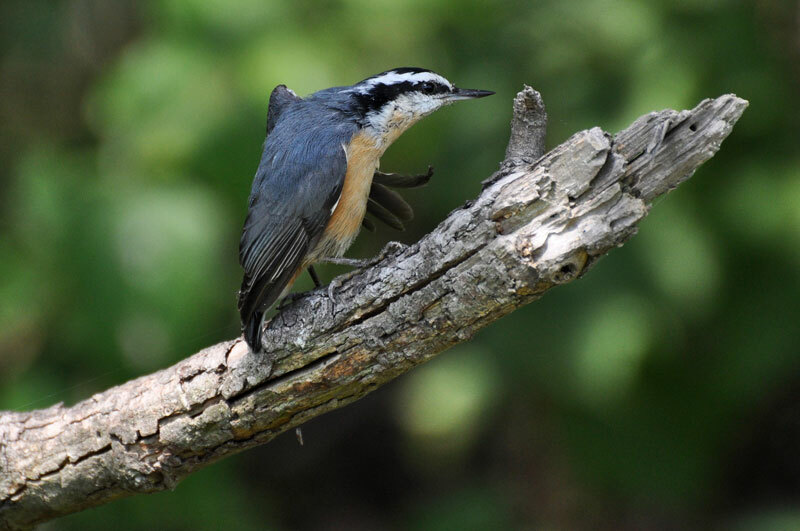 The Red-breasted Nuthatch seems to attain higher populations in the Great Smoky Mountains of Tennessee than in northern Ontario, up to 20 birds per 40 ha being recorded in the former area compared to three to eight birds per 40 ha in Canada. 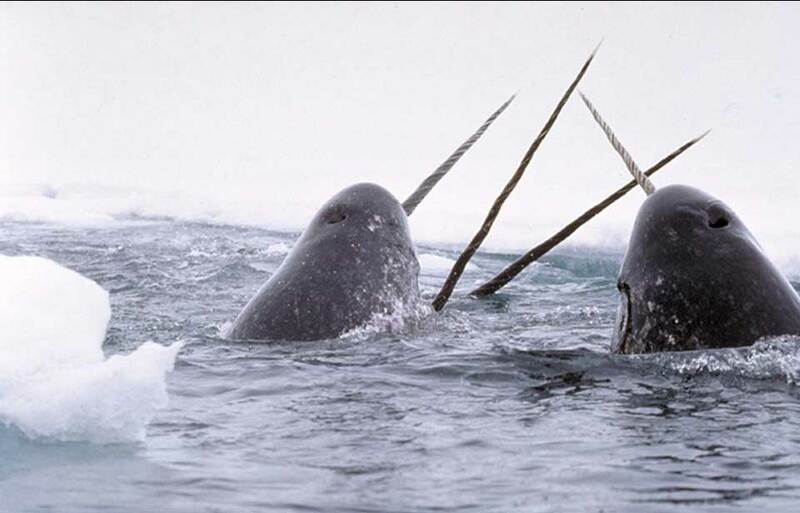 Occasionally large numbers move south of the forests and sometimes appear in open country where they may have to search for food on tall weeds. In 1961, for example, large numbers appeared as early as August, moving across the prairies south to the edge of the coast of the Gulf of Mexico and even down to the Florida peninsula. Thus in many areas the nuthatch appears only occasionally as a winter visitant or migrant. 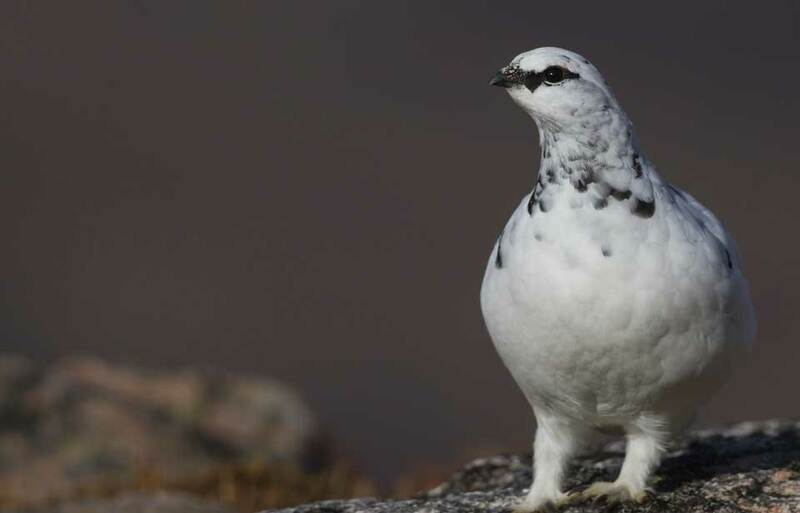 Some observers think that the parents stay in the breeding areas throughout the year and that the small flocks seen in autumn are young of the year. 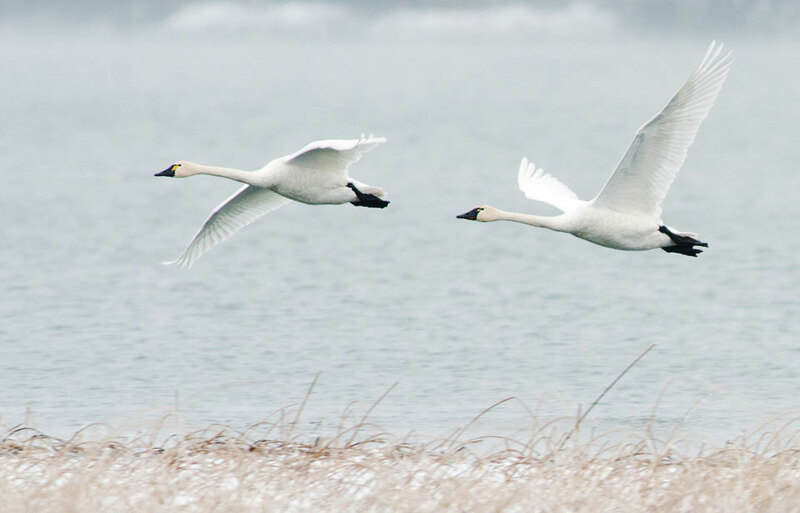 Migrants return to Canada in April, often appearing in company with early migrant warblers. Two of the other three nuthatch species found in North America also occur in Canada, the Pygmy Nuthatch Sitta pygmaea in southern British Columbia and the larger White-breasted Nuthatch Sitta carolinensis mainly in the eastern hardwood forest. The Brown-headed Nuthatch Sitta pusilla breeds only in the southeastern United States. The seeds of conifers make up a large part of the Red-breasted Nuthatch winter diet. The bird pries open the scales of cones with its strong bill and extracts the winged seeds, which it eats after discarding the wing. Following a year of low cone production there will be an early southward movement of nuthatches, crossbills, and other birds that depend upon the cone crop. Insects, as well as their eggs and larvae, or the immature forms, and spiders and their eggs are also important in the nuthatch’s diet. 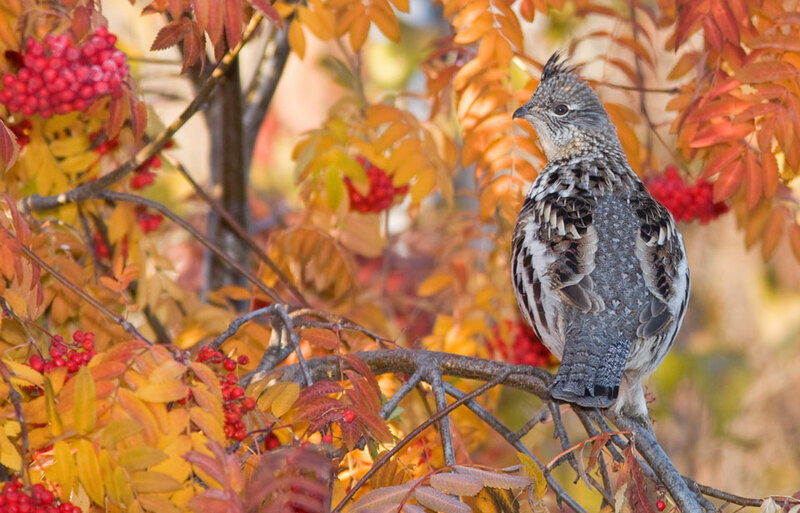 These birds feed on several forest insects. In western fruit orchards they eat an insect pest called the pear psylla; it has thus been recommended that nuthatches be encouraged in pear orchards by erecting bird houses for them. 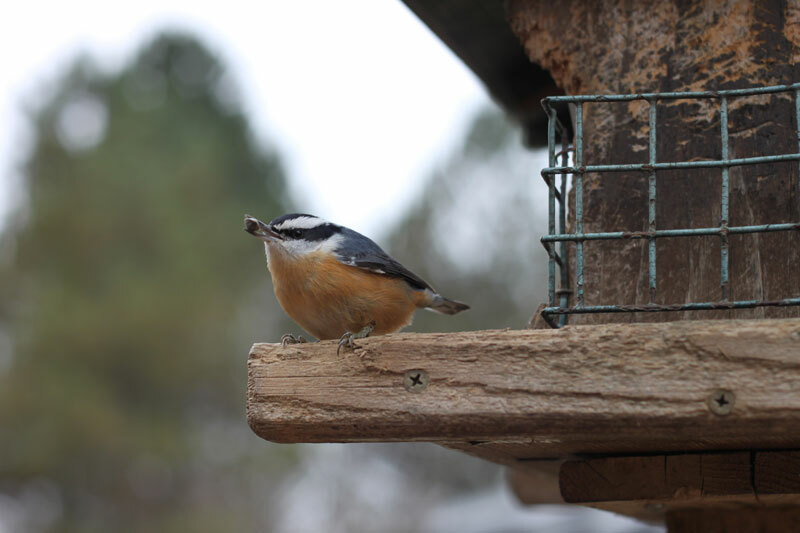 Chopped nuts, seeds, and suet readily attract nuthatches to feeding trays in winter, and the birds often hoard this food, stuffing it in crevices in the bark of nearby trees. 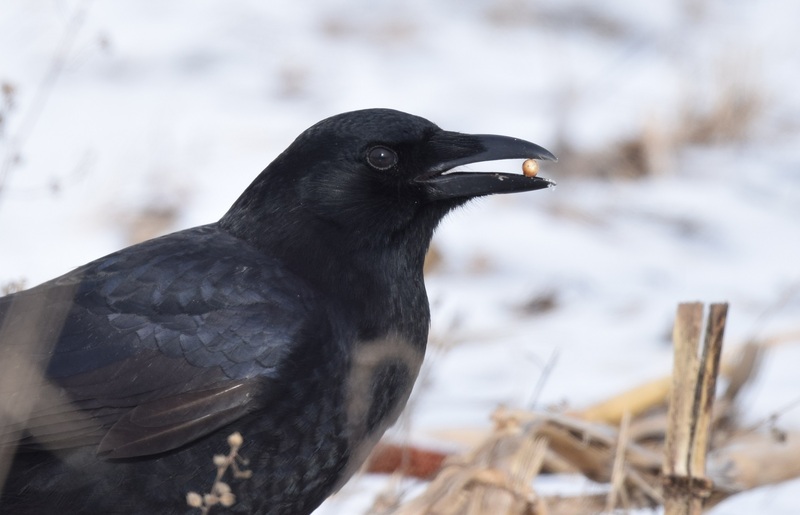 This habit, found in several northern species, probably helps birds survive shortages in mid-winter. The Red-breasted Nuthatch is aggressive and competitive at feeding trays, where it often becomes rather tame. In spring, Red-breasted Nuthatches practise courtship behaviour, which may be initiated by the female. 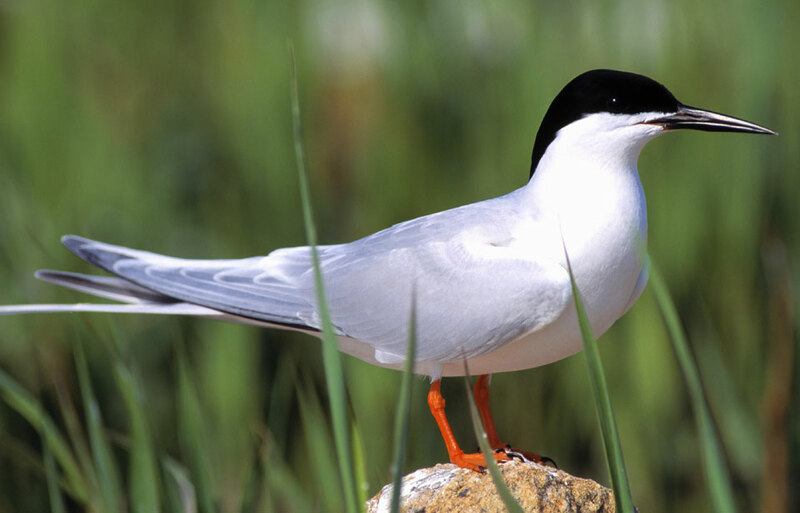 One observer watched the female fly toward a male, displacing him several times, then she "pointed her bill rhythmically from side to side and lifted her wings high vertically above her back, flapping them up and down in time with the movements of her bill." This couple soon afterwards engaged in courtship feeding, the female begging food from the male by "pivoting slowly from side to side like an electric fan in action, while she pointed her bill toward him and shivered her wings as she answered him with . . . soft notes: Tetetetete." 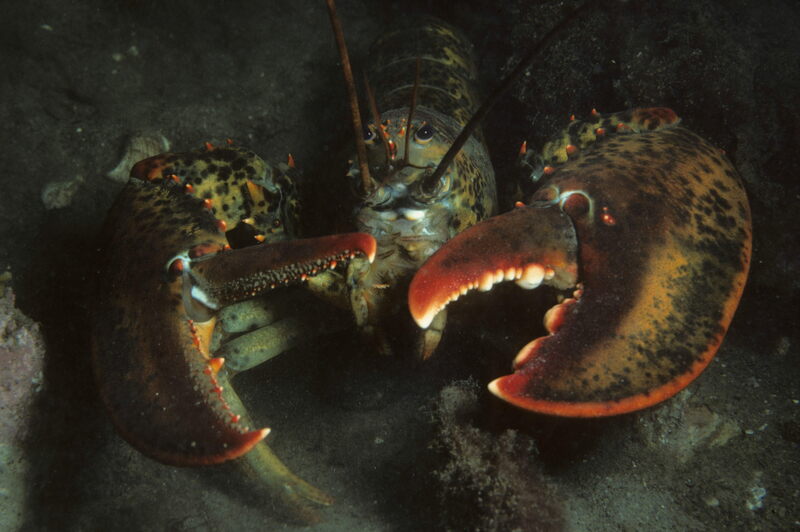 Courtship display between male and female helps the pair achieve co-ordination of their sexual cycles in order to hatch and rear their young when food is most readily available. 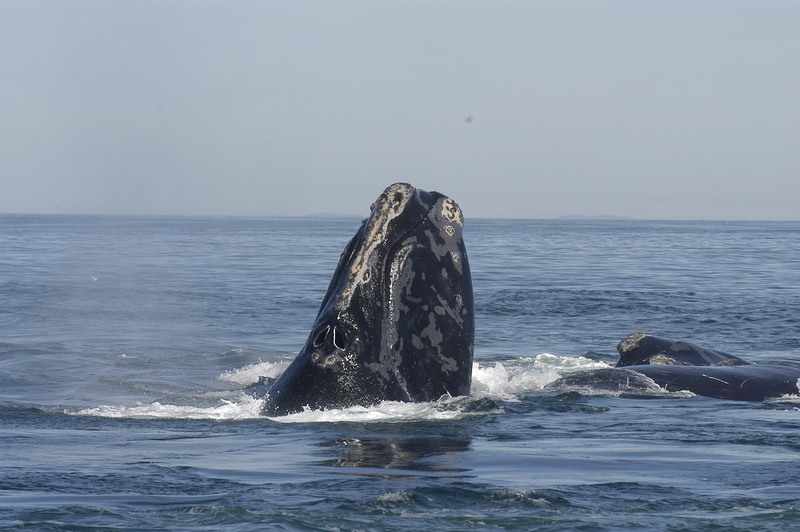 Locating a territory, finding a mate, constructing a nest and rearing the young must be accomplished within a certain period. 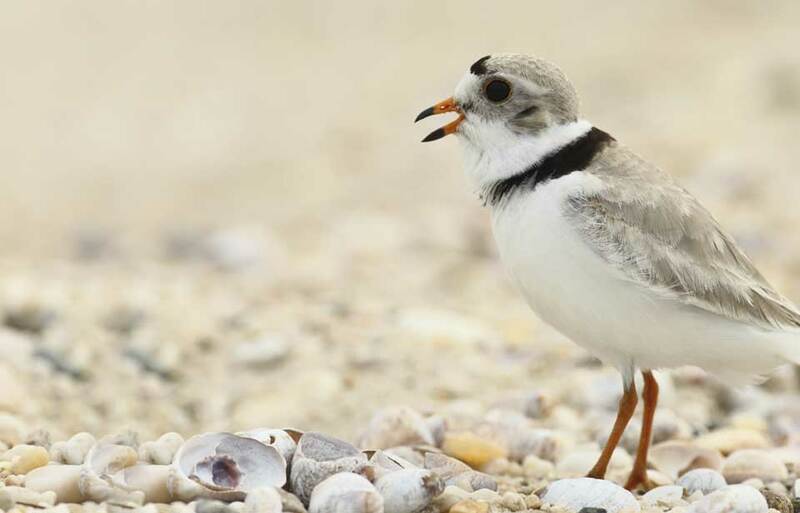 Building a nest may in itself be a considerable feat. 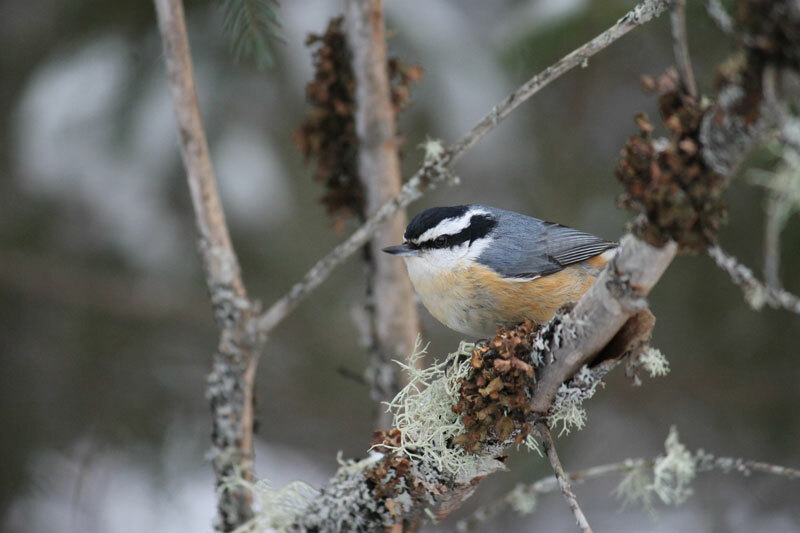 One pair of European Nuthatches, for example, was observed to have lined their nest with 6 695 fragments from birch and pine trees, of which the nearest were 40 and 70 m away, respectively. The number of feeding trips per day for a pair with a nestful of six young varied from 119, two days after hatching, to 353 trips per day 18 days after hatching. The Red-breasted Nuthatch is even smaller than the European Nuthatch and presumably works just as hard to feed its young. 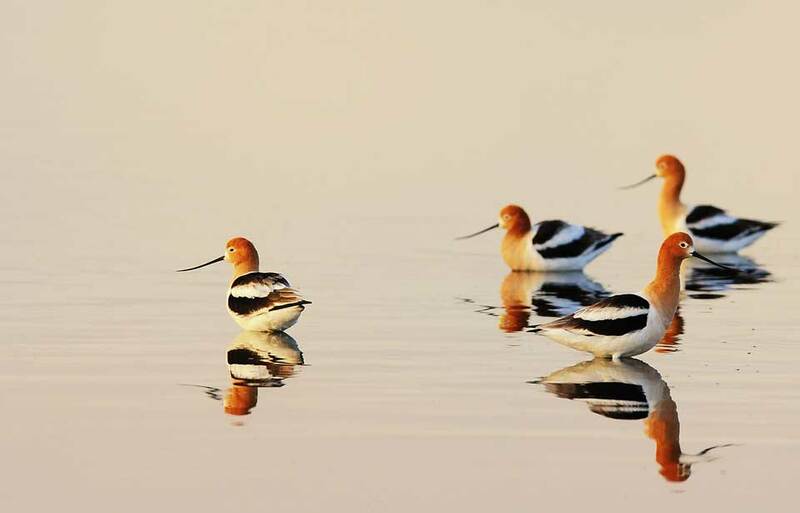 The pair bond formed to permit mating keeps the male and female together throughout the arduous activities of rearing the brood. 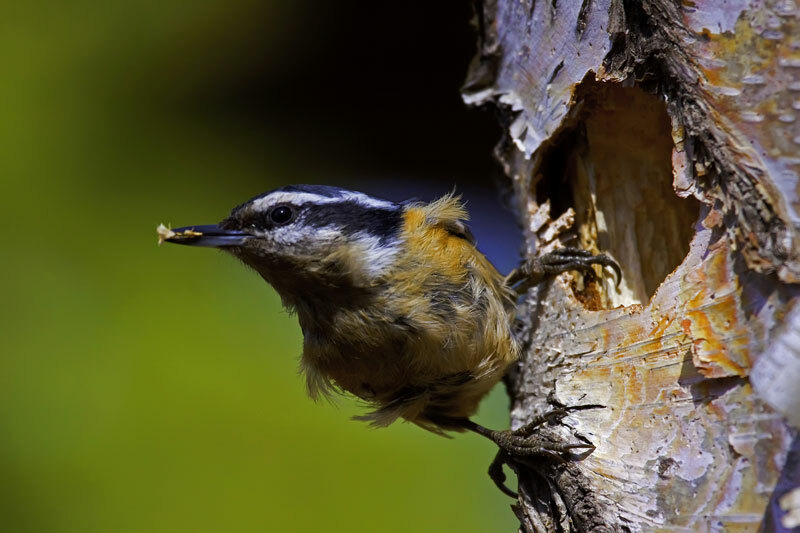 Both sexes usually excavate the Nuthatch’s nest cavity in a decayed tree or stump, though they also use existing holes and occasionally nest in bird boxes. They use a variety of living and dead trees, both deciduous and coniferous. 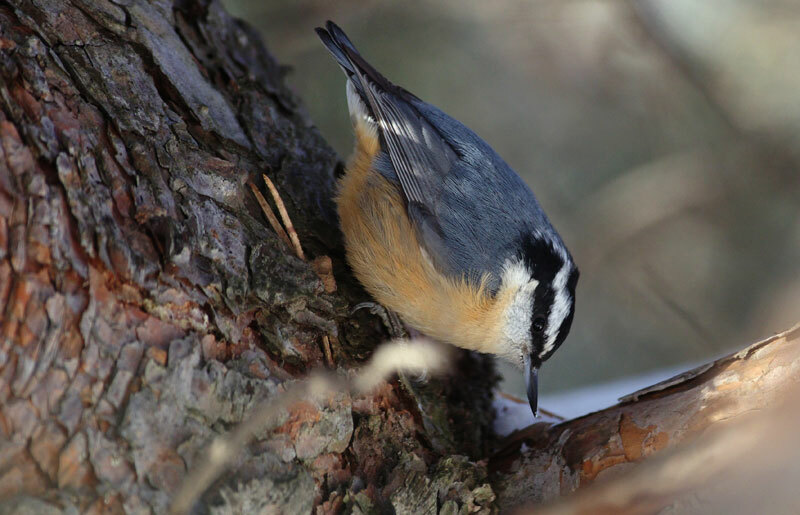 Although Red-breasted Nuthatches are characteristic inhabitants of coniferous forests, they also search for food in deciduous trees and sometimes nest at a considerable distance from conifers. 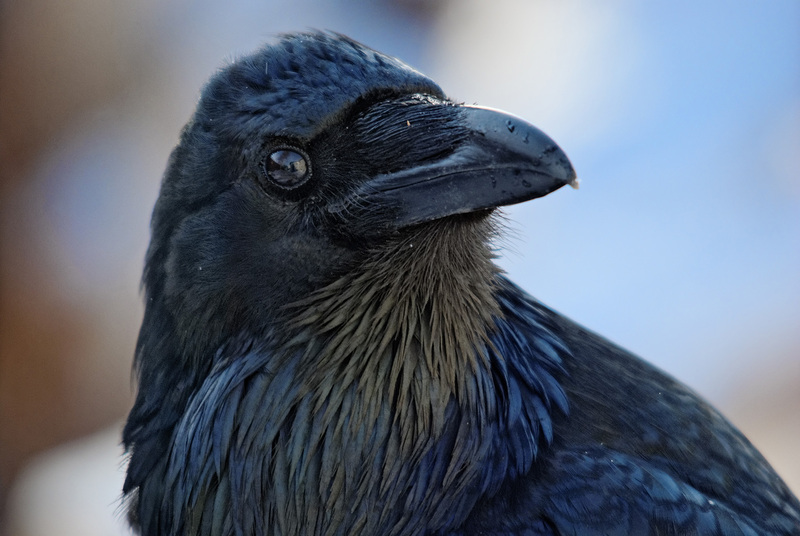 The nest height varies from 0.5 to 36 m, most nests being found about 4.5 m above ground. The cavity is about 20 cm in depth and is lined with soft material such as shredded bark, grasses, rootlets and, often, hair. 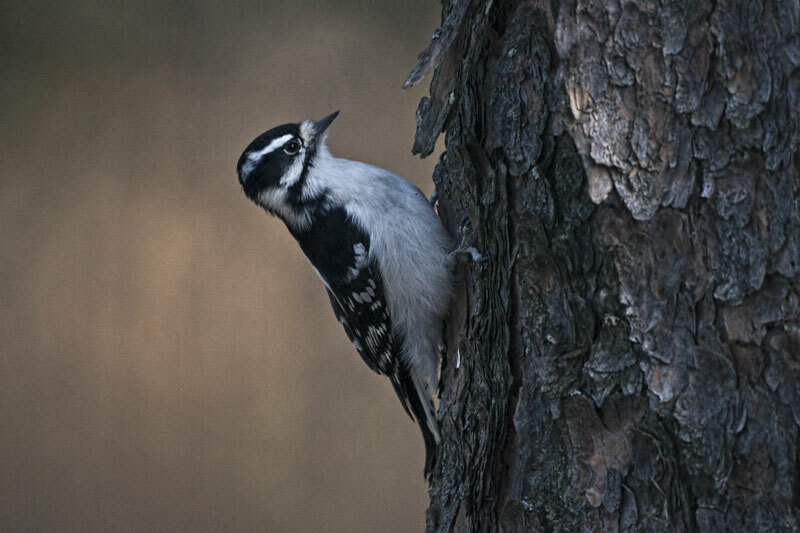 The cavity entrance is invariably smeared with spruce or pine pitch brought by both the male and the female in their bills, often from some distance. 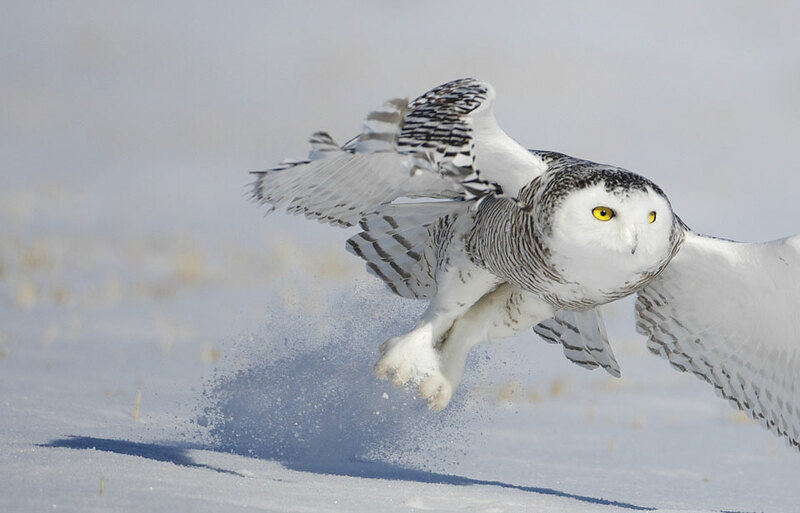 Pitch is carried to the nest from the beginning of nest building until the young have left the nest. 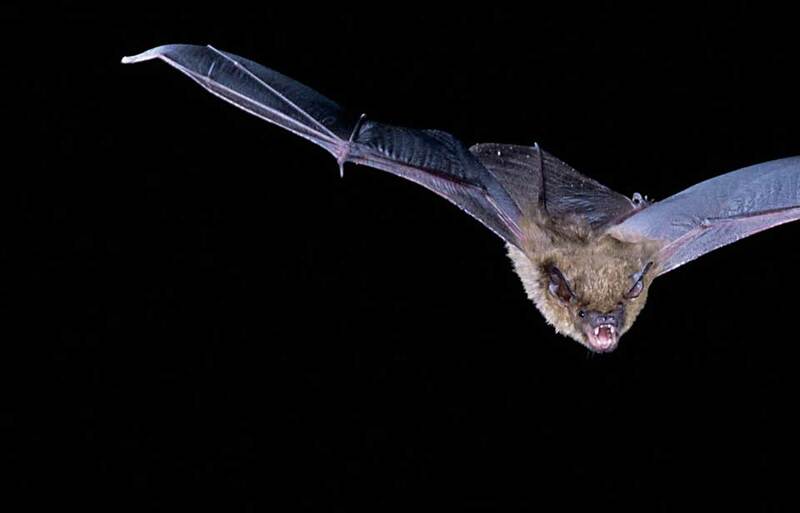 The function of this peculiar habit, which often results in both adults being soiled with pitch before the young have fledged, or taken their first flight, is unknown. 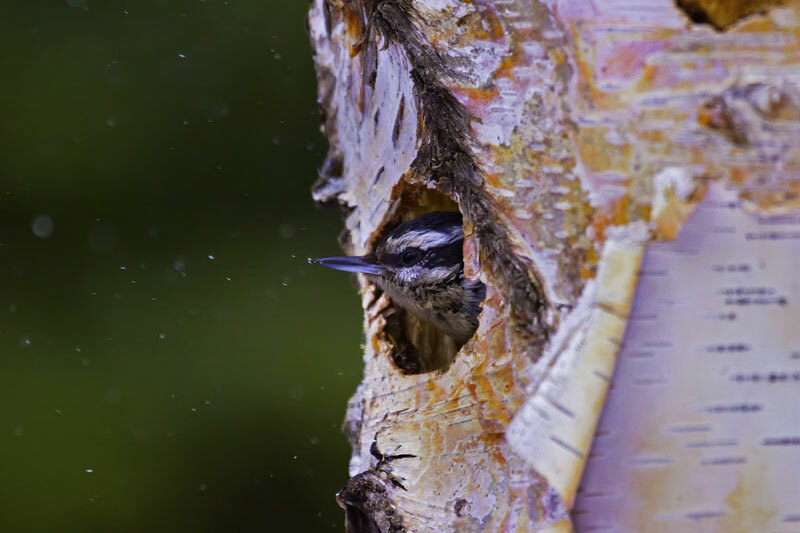 This behaviour may be related to the habits of several eastern hemisphere nuthatch species, which use mud to reduce the size of the entrance to their nest cavity. 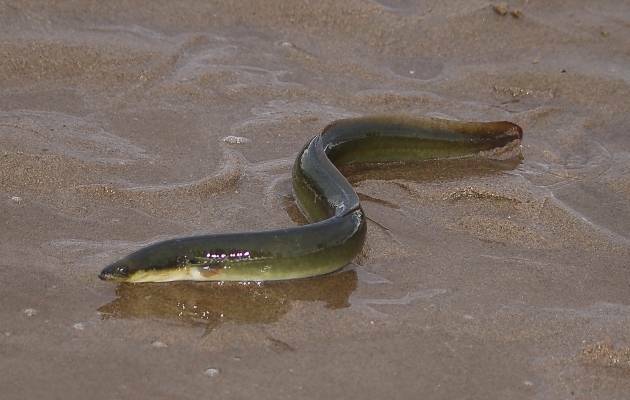 Certain species even construct an entire nest of mud, with a tubular, spout-like entrance. 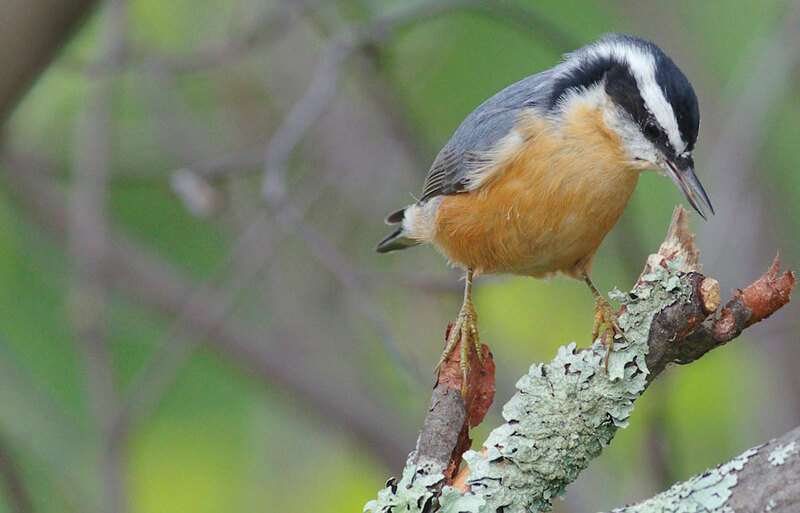 The large mud nest of the Rock Nuthatch may weigh up to 950 times the weight of one bird. Red-breasted Nuthatch eggs are pure white spotted with reddish-brown and are less than 2 cm long. 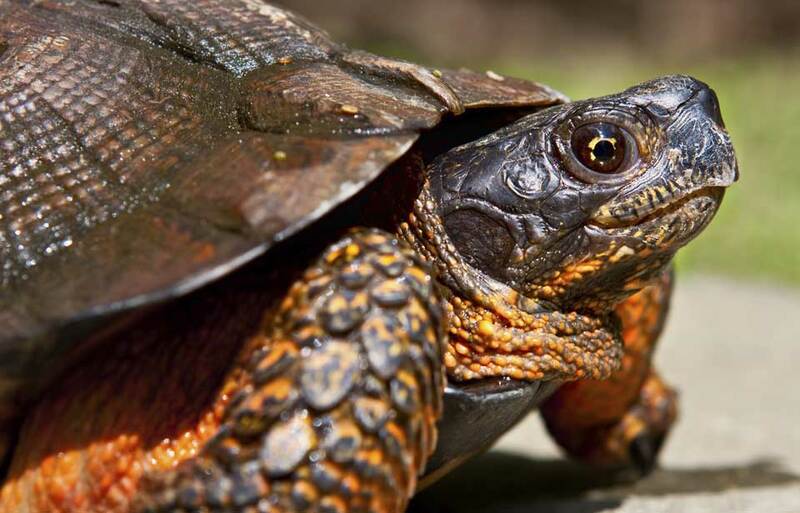 The female lays from four to seven eggs and incubation, or keeping the eggs warm until they hatch, takes 12 days. The young are fed a variety of insects and other invertebrates, or small creatures without a backbone. 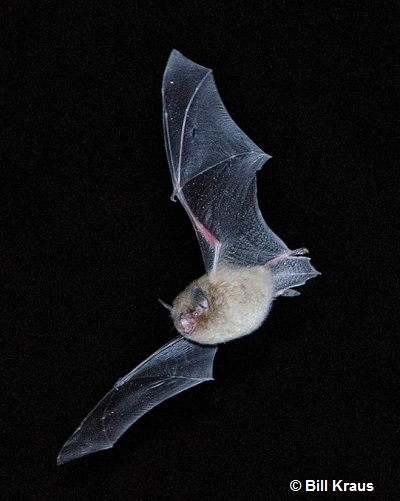 The adults not only seek food on tree branches but also readily capture flying insects, showing that even a bird strongly adapted to one kind of feeding may be flexible in behaviour. 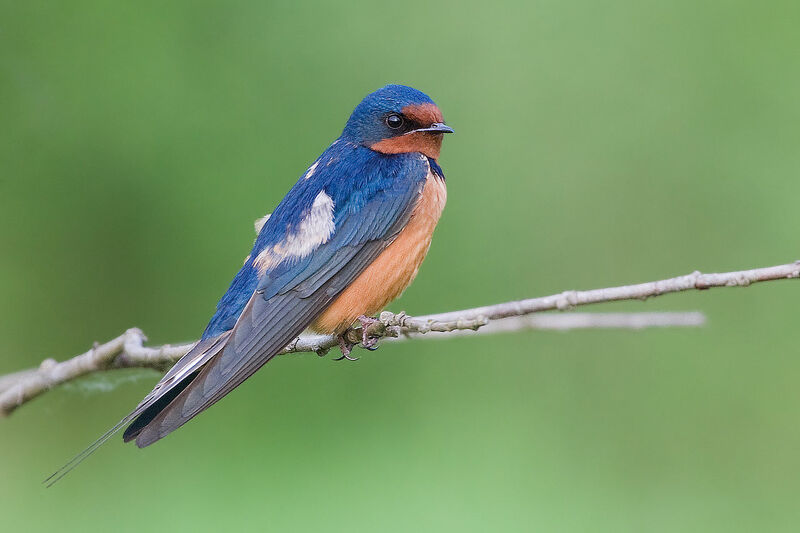 One observer of a Red-breasted Nuthatch nest reported that the male came regularly at about 10-minute intervals with a bill full of large-winged diptera, or two-winged flies. 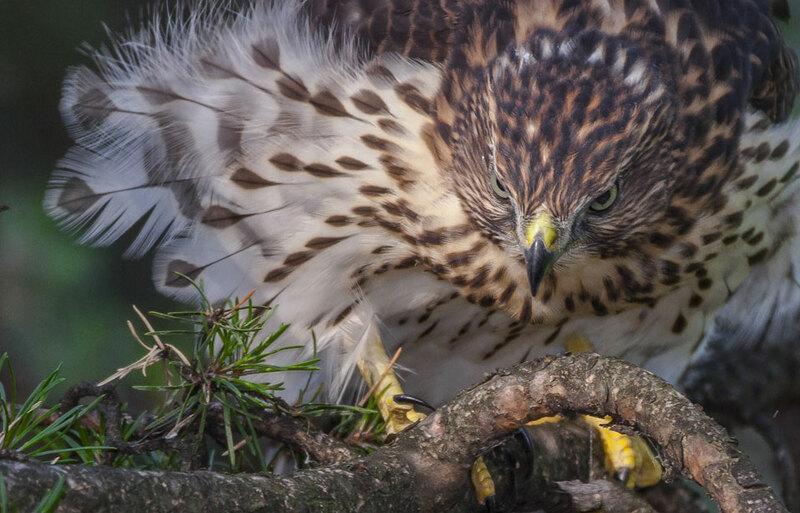 The young are fed in the nest for two to three weeks before they fledge, or take their first flight, and stay with their parents in a noisy family group for several weeks thereafter. This little bird plays a useful role in keeping insect pests under control, and is a welcome addition to bird feeding stations. Bent, A.C. 1961. Life histories of North American nuthatches, wrens, thrashers and their allies. Dover, New York. Forbush, E.H. 1929. Birds of Massachusetts. Volume III. Massachusetts Department of Agriculture. Godfrey, W.E. 1966. Some Canadian birds. National Museum of Canada, Ottawa. Lawrence, L. de K. 1958. Irrepressible nuthatch. In J.K. Terres, editor. The Audubon book of true nature stories. T.Y. Crowell, New York. McKenny, M. 1939. Birds in the garden. Reynal and Hitchcock, New York. Roberts, T.S. 1932. The birds of Minnesota. Volume II. University of Minnesota Press. Salt, W. R., and A. L. Wilk. 1966. 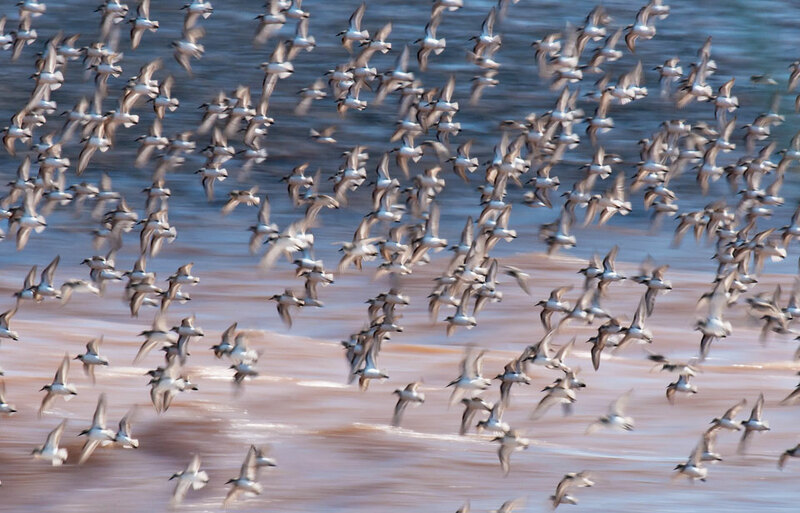 The birds of Alberta. Queen’s Printer, Edmonton. Snyder, L.L. 1951. Ontario birds. Clarke, Irwin, Toronto. Tufts, R.W. 1961. The birds of Nova Scotia. Nova Scotia Museum, Halifax. © Her Majesty the Queen in Right of Canada, represented by the Minister of the Environment, 1973,1978. All rights reserved.